What is it About a Pipe Band? The other day, whilst browsing round the charity shops, E found a recorder that HAD to come home with us. As I paid, the woman at the till said, "Oh look at him, he's going to be a (bag)piper. Must be in his genes." I replied, "Well, maybe, but with an American mother and a South African father, I am not sure genes will have much to do with it." "Oh, he probably won't be a piper then...maybe a rugby player". But truth be told, we may have a piper on our hands as he loves the melodic cacophony that belts from this traditional instruments. 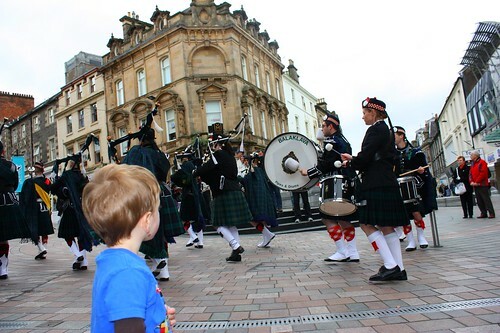 He gravitates towards loan pipers in the street and a pipe and drum band nearly sends him over the edge with wonder. But here is my confession: I don't like bagpipes. Other than seeing strapping Scottish lads in kilts (who doesn't love that? ), bagpipes leave me totally cold. Sure they add a certain moody charm when wandering around Edinburgh and yes, haggis should be piped in on Burns Night, but beyond that, ehh. Kevin has insisted that I used to really like them. That I used to comment about how perfect they sounded when we came upon them in the street. My memory has been erased by spending this last summer in the garden while one (or three) of my neighbours practised bagpipes outside on every nice day. Listening to 123 Ferry Orchard's rendition of Celine Dion's My Heart Will Go On on a bagpipe is enough to scar anyone for life. Well, except for Ellis but he's two and thinks that macaroni pie is haute cuisine.